The best ways to farm for Units in No Man's Sky NEXT. In No Man’s Sky NEXT, the currency you earn for completing various actions is called Units. Similar to other resources in No Man’s Sky NEXT like Cobalt or Chromatic Metal, you can farm for Units. There are a variety of ways to farm for Units in No Man’s Sky NEXT, some better than others. If you’re looking for the best and easiest ways to farm Units in No Man’s Sky NEXT, we’ve got you covered. Below, you’ll find a quick guide on how to earn Units fast in No Man’s Sky NEXT! There are a few different ways to farm Units fast in No Man's Sky NEXT. While it’s true that just about everything you do in No Man’s Sky NEXT will net you Units, some methods are better than others. This is because you’ll earn more Units for your time. Completing Missions: Every mission is different and will require a different level of effort. However, most yield a high amount of Units. Ship Bounties: Complete Bounties to earn Units in No Man’s Sky NEXT. Like missions, Bounties are different in the effort required, but all yield a substantial amount of Units. Buy Frigates: The more Frigates you own, the easier it is to send multiple out on missions at the same time. This is one of the easiest ways to earn Units in No Man’s Sky NEXT, as all you need to do is send your Frigates out and wait. 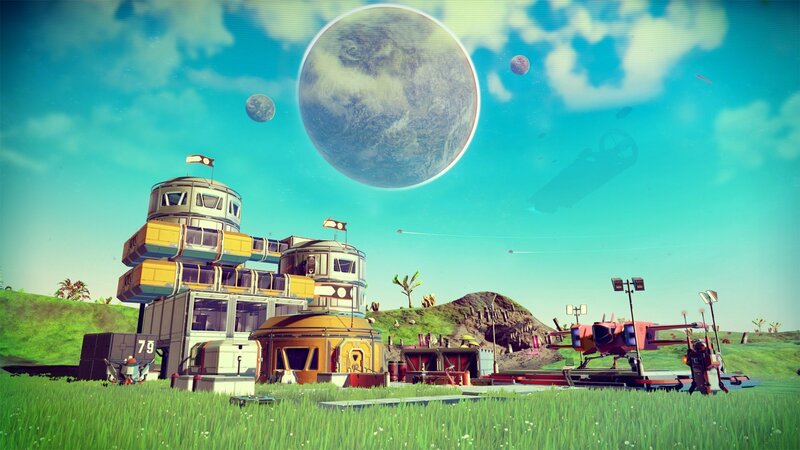 Build a Base: By building a base and farming, you’ll be able to steadily accrue Units in No Man’s Sky NEXT. Farm Chlorine: Chlorine is an extremely valuable resource that’s relatively easy to farm, making it perfect for increasing your Units in No Man’s Sky NEXT. Asteroids: Fly your ship close to the planets you explore and look for asteroids. Asteroids can contain gold and/or platinum. By mining for these resources via asteroid fields, you have the ability to net substantial Units. Planet Discovery: Head out and discover planets, as you’ll be rewarded with a quarter of a million Units for a full planet discovery. Remember to upload these planet discoveries in the Discovery Menu. Scanner Upgrades: By upgrading your Scanner, you’ll be able to receive increased Units for scanning the flora and fauna of different planets. Upgrade Storage Slots: By upgrading your Storage Slots, you’ll be able to make your farming endeavours more profitable as you’ll be able to fit more items and resources in your ship. Advanced Mining Beam: Upgrade to the Advanced Mining Beam for the ability to mine rarer materials, and mine faster. Bypass Chips: Bypass Chips are crafted from Iron and Plutonium, selling them earns you a sizable amount of Units in No Man’s Sky NEXT. Stasis Devices: When you’ve collected all of the farming Blueprints, you can then begin farming Stasis Devices. Like Chlorine, Stasis Devices are extremely valuable and yield a high amount of Units. 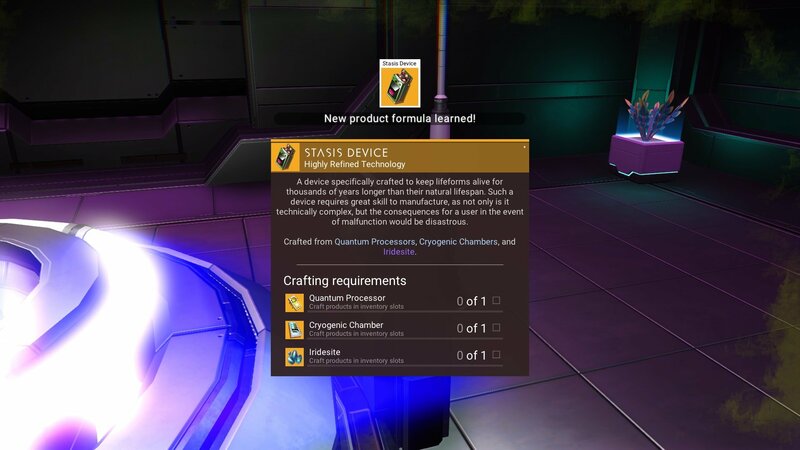 Farm and sell Stasis Devices to earn Units in No Man's Sky NEXT. Cryo-Pump Method: Noted first in the No Man’s Sky subreddit, the Cryo-Pump method requires you to get the Blueprint for the Cryo-Pump which can be found in Abandoned Factories on planet surfaces. Then, buy the ingredients to craft it (Hot Ice, Thermic Condensate) at a Space Stations. Craft your Cryo-Pump, then sell it for 2 million Units each. This is far more than the parts to build it cost, meaning you can continue to re-buy the materials and sell your Cryo-Pump for Units. Whispering Eggs/Larval Cores: Some of the most valuable resources when it comes to Units are Whispering Eggs. To farm these safely, bring resources for a Base Computer and four wooden walls with you on your adventures (40 Chromatic Metal, 160 Carbon). Then, plant your Base Computer and build a wall around the collection of Whispering Eggs. By mining a Whispering Egg outside the walled area, you’ll trigger the appearance of a Biological Horror. Fortunately, it should be trapped within the walls you created as Biological Horrors cannot jump or climb. You can use your Jetpack to mine all of the clustered Whispering Eggs, remembering to pick up all Larval Cores as quickly as possible. With your Larval Cores, head to a Space Station and sell them. You should be able to net over 3 million Units from each Whispering Egg site you find. Be careful farming Larval Cores from Whispering Eggs, as these contain Biological Horrors in No Man's Sky NEXT. The methods above are just a few ways to farm Units fast in No Man’s Sky NEXT. By playing through the game, you’ll eventually get into a rhythm of farming Units that works best for you. For example, sending your Frigates out before selling off goods at your local Space Station. 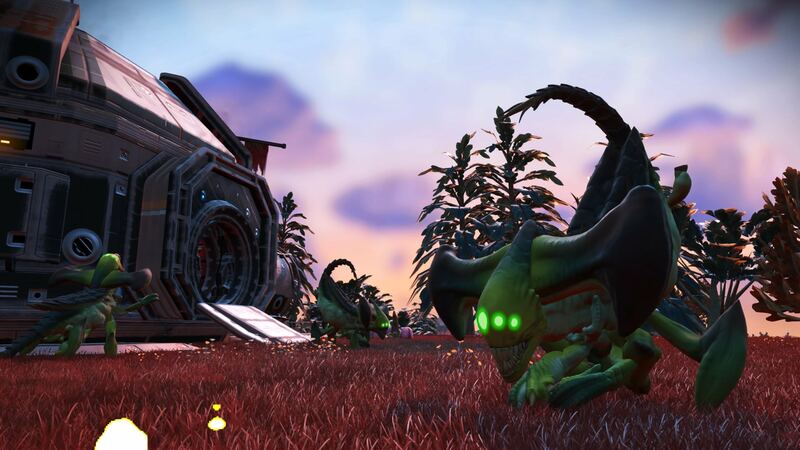 For more on No Man’s Sky NEXT, be sure to check out our previous guides including how to get Chromatic Metal in No Man’s Sky NEXT, how to get Cobalt in No Man’s Sky NEXT, and how to build and use a Portable Refiner in No Man’s Sky NEXT. By reading through this guide, you should now know how to farm Units fast in No Man’s Sky NEXT.